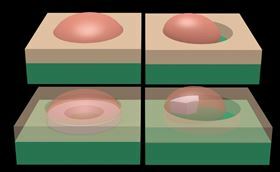 This illustration shows two different configurations of the gallium droplet within the hole –fully filled and partially filled. Below, the fully-filled hole leads to the growth of a complete ring of gallium arsenide crystals, while the partially filled hole leads to the growth of just a segment. Image: EPFL. Nanowires have the potential to revolutionize many aspects of technology. Measuring just 5–100nm in diameter, these tiny, needle-shaped crystalline structures can alter how electricity or light pass through them. They can emit, concentrate and absorb light, and could therefore be used to add optical functionalities to electronic chips. They could, for example, make it possible to generate lasers directly on silicon chips and integrate single-photon emitters for coding purposes. They could even be applied in solar panels to improve how sunlight is converted into electrical energy. Up until now, however, it was impossible to accurately control the growth of nanowires on silicon semiconductors – there was no way to repeatedly produce homogeneous nanowires in specific positions. But researchers at the Ecole Polytechnique Fédérale de Lausanne (EPFL)'s Laboratory of Semiconductor Materials in Switzerland, run by Anna Fontcuberta i Morral, together with colleagues in the US and Russia, have come up with a way of growing nanowire networks in a highly controlled and fully reproducible manner. The key was to understand what happens at the onset of nanowire growth, which turned out to go against currently accepted theories. The researchers report their work in a paper in Nature Communications. "We think that this discovery will make it possible to realistically integrate a series of nanowires on silicon substrates," says Fontcuberta i Morral. "Up to now, these nanowires had to be grown individually, and the process couldn't be reproduced." The standard process for producing nanowires on silicon semiconductors is to make tiny holes in silicon monoxide and fill them with a nanodrop of liquid gallium, which solidifies when it comes into contact with arsenic to form gallium arsenide. The problem with this process is that gallium arsenide tends to harden at just one section of the nanoholes, which means that the angle at which the nanowires grow can't be predicted. The search was on for a way to produce homogeneous nanowires and control their position. Previous research aimed at controlling the production process has tended to focus on the diameter of the hole, but this approach has not paid off. Now, the EPFL researchers have shown that by altering the diameter-to-height ratio of the hole, they can perfectly control how the nanowires grow. At the right ratio, gallium arsenide will solidify in a ring around the edge of the hole, thereby preventing the nanowires from growing at a non-perpendicular angle. And the researchers' process should work for all types of nanowires. "It's kind of like growing a plant. They need water and sunlight, but you have to get the quantities right," says Fontcuberta i Morral.